Are you a talented professional interested in applying your expertise to get real business value for clients? As a CRM Package Consultant, you’ll team with some of the best minds in the industry to create innovative high quality solutions focused on clients’ business needs. As part of a growing European team, you will have the opportunity to expand your skills with innovative projects of international scope. – Have demonstrated expertise in project execution across the project lifecycle. – A sound overall understanding of the greater systems around CRM. 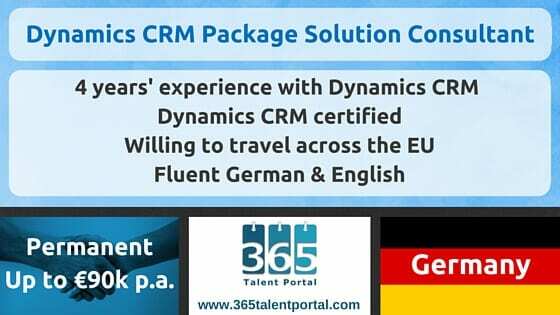 If you’d like to find out more, sign-up to www.365talentportal.com or contact us.